DESCRIPTION Welcome to the exceptionally located private and gated complex of Chateau Falls! 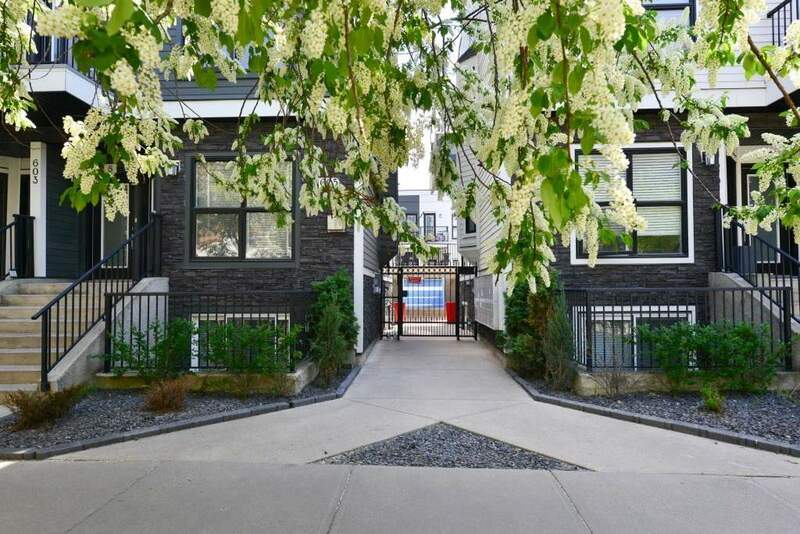 This 2 bedroom 1 bathroom condo is surrounded by the trendy restaurants and bars of 17th Ave and minutes to downtown, yet offers a private and quiet location with a large East facing balcony overlooking a beautiful courtyard fountain in the summer. Extensively renovated in 2013, this condo features 10 ft ceilings, an open concept plan with stunning granite counters, new dishwasher, new hot water tank (2017), and new high end split duct central air conditioning (2016). The sitting area with gas fireplace overlooks the fountain and deck as does the dining area. The master bedroom offers a custom walk-in closet, and good sized bathroom with heated floors. The second bedroom also has built-in closets. This well-maintained building, also renovated in 2015, offers underground indoor parking and storage locker. This property is excellent value.